A recent study of students in the Chicago Public Schools by brain researchers at Northwestern University, detailed in Neuroscientist and Education Week, stated that students who participated in instrumental music performances scored significantly higher than their non-band peers in standardized tests. 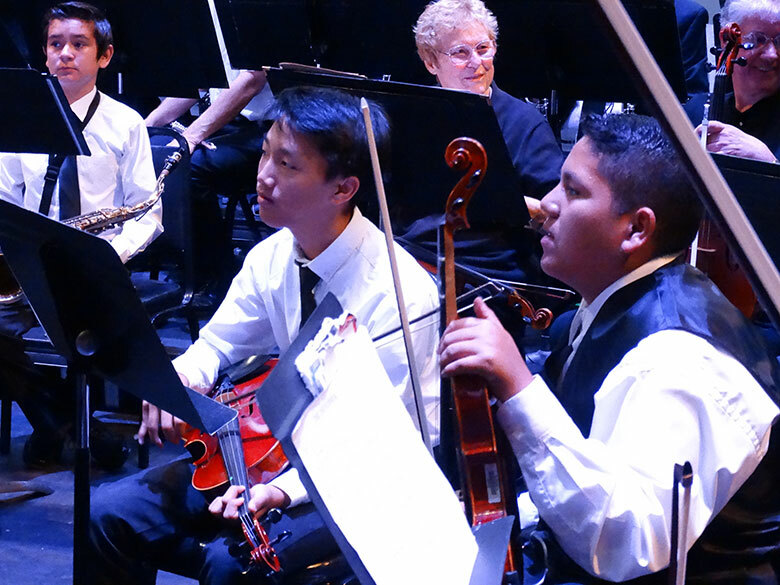 At the April 2017 event, thirty Norwalk-La Mirada middle school musicians, all District Honor Band members, got their first experience performing on the big stage when they joined with the La Mirada Symphony for a pair of performances April 19 at the La Mirada Theater for the Performing Arts, with more than 2,000 district students in the audience. The Youth Enrichment program performance is a showcase for the district’s Visual and Performing Arts (VAPA) program. Two district music teachers – Vanessa Trevino from Benton Middle School and David Yamamoto from Corvallis Middle School – served as guest conductors. 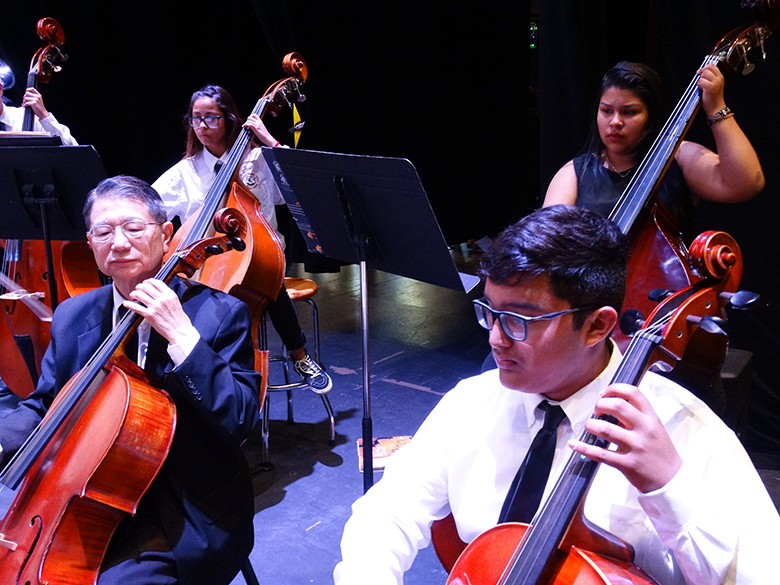 Back in April 2016, the Downey Patriot, an online publication, visited the La Mirada Symphony Orchestra during a performance at the La Mirada Theater for the Performing Arts that included thirty middle school musicians in a very special concert. During their visit, they spent time with our conductor Alan Mautner and many of the young people who were chosen to perform with the symphony on stage. At the event, thirty Norwalk-La Mirada middle school musicians, all District Honor Band members, got their first experience performing on the big stage when they joined with the La Mirada Symphony for a pair of performances April 19 at the La Mirada Theater for the Performing Arts, with more than 1,000 district students in the audience. Over 2000 5th graders from the Norwalk-La Mirada Unified School District attended a free concert performed by the La Mirada Symphony on Tuesday at the La Mirada Theatre for the Performing Arts. Conductor Alan Mautner had created a program to peak the interest and enthusiasm of the young people present. It did just that. In addition, he invited 4 members of the audience to ’volunter’ to join on stage at one point to ‘enhance’ “Fiddle Faddle” by Leroy Anderson with small instruments, much to the pleasure of the students present. 30 Middle School Honor Band students sat in with the orchestra to play two selected pieces directed by Band teachers Vanessa Trevino, Benton School in La Mirada , and David Yamamoto, Corvallis School in Norwalk. The audience was pleased to see their school mates performing on stage, and the Honor Band participants were excited to play beside their adult counterparts. Introduction to the Orchestra by Kraft gave the young audience a chance to hear the sounds of all of the instruments on stage, individually and collectively. Many were inspired to play instruments themselves and were ready to add music to their curriculum at school. 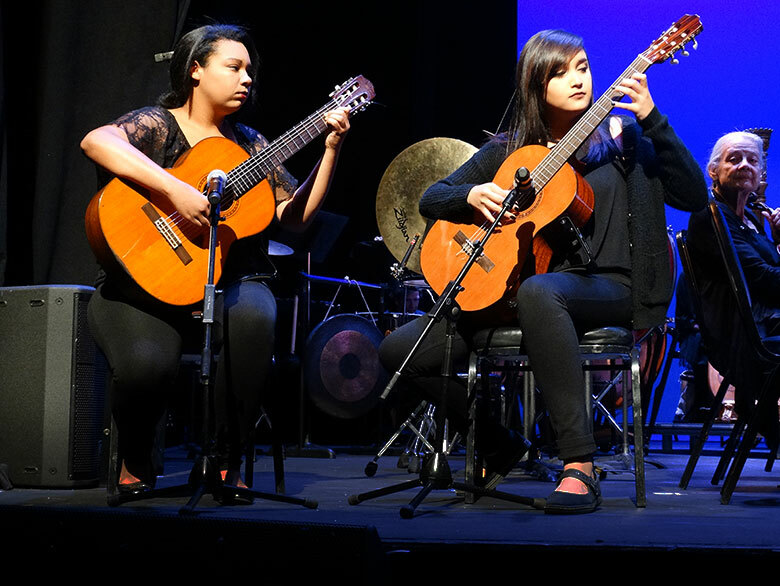 As a special treat, Alyssa Salas and Kayla Harrell duo guitarists from La Mirada High School and winners of a competition provided by the Symphony Association, played for the audience. Their agile finger work produced another inspiration for the 5th graders present. 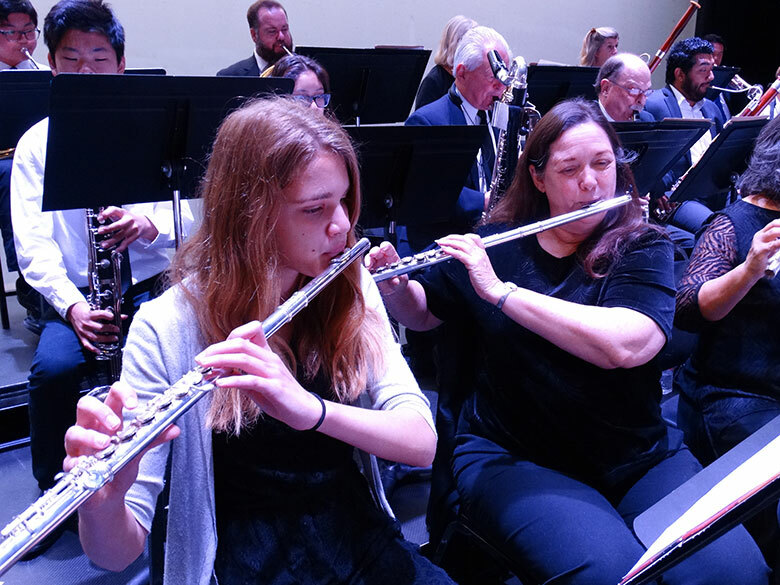 Some of the pieces and much more music by American Composers will be played by the orchestra at the FREE Annual POPS concert at 8:00 p.m. on Saturday, April 23 at the Theatre.